To provide the advice people need for the problems that they face. The first aim is what most people think of if they are asked what Citizens Advice do. The second aim is less in the public eye but is equally important. When we see unfair policies and practices, we aim to change them. For example, if many customers are having difficulty completing a form it may be because the form is too difficult to understand. If it was clearer and simpler it may save customers time and it could also save the council or government department or utility company money as receiving forms with errors takes time to sort out. Starting in 2017, CAML have been working with national Citizens Advice to research the issues affecting our clients and campaign around these issues through short, bite-sized volunteering opportunities called micro-volunteering. We have now finished three research reports, both looking at the impact of mental health for our clients in relation to welfare benefits. Our first report asked the question: “Does having a mental health condition disproportionately affect a person’s eligibility for welfare benefits?” You can read the a summary of the report here and the full report here. Our second report builds on the first to focus on how Employment and Support Allowance is experienced by those affected by mental health, including those with a mental health diagnosis, and the people who support and care for them. You can read this report here. How Research and Campaigns Influences Change? A customer may come to one of our offices or call us to seek advice on a particular problem. While addressing this the adviser may identify an issue which could have an impact on other people as well. As well as helping the individual client, we can also use the information gathered from all the clients affected by the problem. We do this by anonymously sharing it with people responsible for influencing policy, and campaigning for change. If it is a local problem, we campaign locally, sharing it with our MPs, councillors or London Assembly members. We can also do this nationally, by sharing the evidence with national Citizens Advice where it is brought together with reports from other Citizens Advice offices across the country. This research and campaign action can be a more efficient way of tackling the root cause of a problem than doing the same work again and again on behalf of individual customers who are all experiencing the same difficulties. We don’t always get the changes we would like, but the solid evidence of the numbers of people we see who have problems in an area means that our proposals are listened to. What sort of thing do we campaign about? Sometimes our campaigns are aimed at consumers, trying to raise awareness of a particular problem. For example, used cars are the biggest single issue being reported to Citizens Advice consumer service – it deals with over 80,000 used car problems a year. 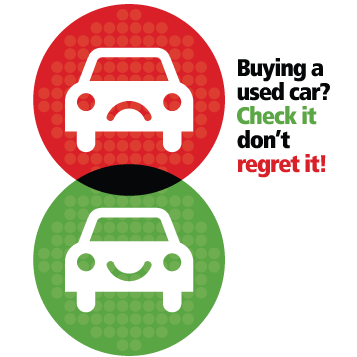 So one month we ran a “check it – don’t regret it” campaign highlighting how to check a car’s mileage, see if it’s stolen etc.